Sat night we went to see a play. Miso, which means smile in Korean. My inlaws came to Korea to visit. We only had 4 days so what we could see was somewhat limited but enough to give them a good taste (no pun intended) of the country. 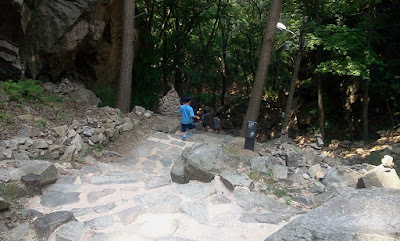 We saw some temples, some fortresses and some of the good tourist places (we avoided Itaewon like the plague). Sat night we went to see a play. Miso, which means smile in Korean. It seems that my wife reserved tickets for Sunday. Luckily we were able to change them. We got the back row and then the pre-show started before we were in our seats. As a permanent show, it is popular with tour groups. So it want surprising to see a whole bunch of Chinese tourists waiting to see the show. What was surprising was to sere them sitting in the seats we just purchased. Then refusing to move saying “stay together” as the Chinese chick indicated to the row in front of her. So we get one if the staff who had to continuously and insistently ask them to move. Ooh the howels of protest that brought. Seriously. Theses people just literally decided that the seats at the back were better and moved there, then proceeded to argue with the theatre staff on why they should be allowed to stay. It was pathetic. And just to clarify, we weren’t the only ones who wanted the seats we paid for. Eveeeentually they moved. Not without some dirty looks, to wit I returned equally. Then later on, when they were finally seated down near the front, when ever one of them turned back, I smiled at them and waved happily. Welcome to the truly capitalized world Chinese tourists! Where we sit where we paid for and not move around on a whim. Yes indeed, I smiled, just like the play name. I have been fascinated with various spiritual beliefs for quite some time. I have studied many of them and last weekend I had the chance to experience, if somewhat peripherally, some Zen Buddhism. It was quite the experience and extremely physically taxing but we will get to that in a bit. 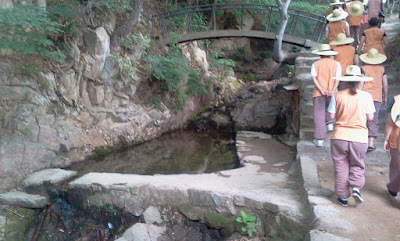 I went with Adventure Korea and a group of about 30 of us. Only five of us were guys. 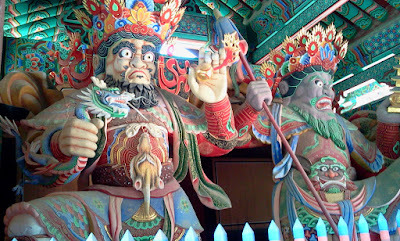 Walking up to the temple, you are greeted by some very handsome fellows. One of these days I will find out what the deal is with them. I had forgotten to ask. 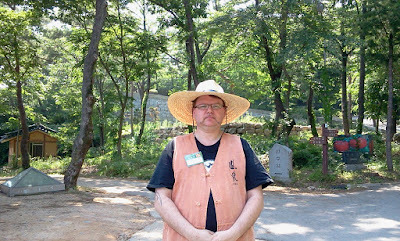 Once we arrived, we were given ‘temple clothing’ to wear. Pants and vest. 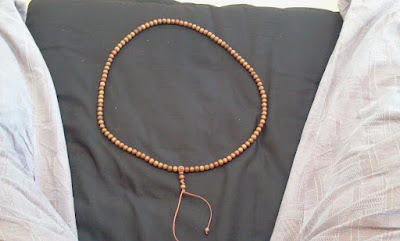 One of the first activities was doing 108 bows while making a prayer necklace at the same time. And for every bow, add one wooden bead to the string. Sure it looks great and possible even simple, but the effort it took while doing so was killer. Here is a video of a Korean doing only 3 full bows. Now, in the video he did it only 3 times. Our group did it 108! 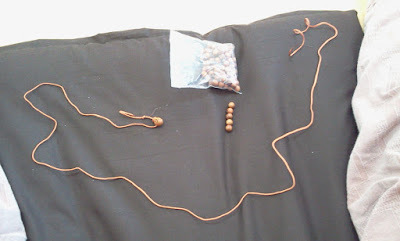 Each time we added a bead to the necklace. I was sore, I was sweating, my hands even began to tremble while trying to put the thread through the hole of the bead but I got it done. A little later we then went on a guided tour of the grounds. 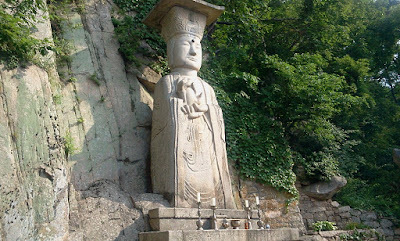 Now, what you need to know about Korea and this post are two things. First, Korea has lots of mountains. Second, Temples are built on the sides of mountains to be closer to a natural surrounding. So, when I say ‘tour’, I meant to say ‘Lets climb a bunch of steps after you just killed your legs doing 108 bows.’. Sigh. Still, I did that too. What you see here is the main temple (middle) and three stupas. A stupa (from Sanskrit: m., स्तूप, stūpa, Pāli: थुप “thūpa”, literally meaning “heap”) is a mound-like structure containing Buddhist relics, typically the remains of Buddha, used by Buddhists as a place of worship. The Stupa in the background (closest to the Temple) is pretty old (hundreds of years, don’t recall exact time) and the one to the left is fairly new. The new one purportedly contains some of the ashes of the Buddha. The Elephant one we weren’t told anything about. 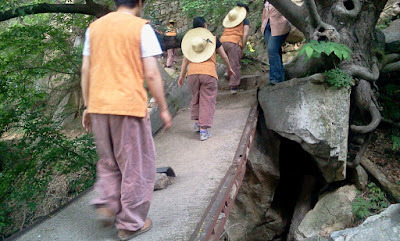 There was a monk ringing a bell. Don’t know which ceremony this part was for but it was interesting. Seeing as I am a meatarian, I did not participate in any of the meals. Yes, that meant I missed out on part of the experience but such is life and donuts. 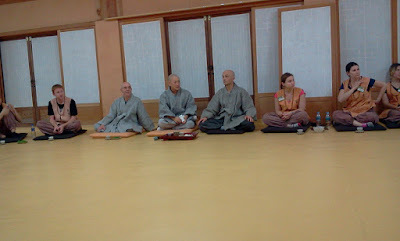 I am what I am :) After dinner we had a talk with some Buddhist monks. Then it was lights out at 9pm because we were getting up at 3! For me, this was the most difficult part. Not the getting up but the going to sleep! I had the hardest time and slept only in pieces. At one point I was awake and thought, ‘geeze, gotta be after 1am by now’, I looked and it was only 11:14. Dammit. Well, eventually slept enough sporadically and got up at 3am with no issues. 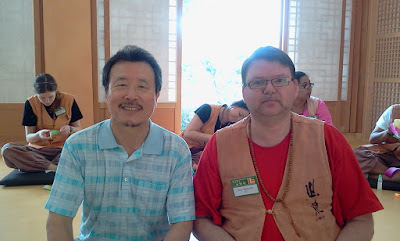 We put on our temple clothes, having taken a shower the night before, and all filed over to the morning drum ceremony. I took a short video of this but seeing as it was 3:30am, there was no light int he sky so all you will see is black and maybe the odd flash of someone taking a picture. So after breakfast we went hiking. It’s not like my legs were near mush from the 108 bows already, this put me almost over the edge! 500 stairs up the side of a mountain. Sure, it was beautiful but man was it killer. I thought going up was hard! Going down proved to be the worst for me. We didn’t go down the steps, instead we went down a paved road (dammit, why didn’t we take THAT up!). What was hurting me the most was my thighs, nothing else. So going down which muscles do you use to stop you from falling forward? That’s right, your thighs! The road is purely steeped at some ugly angle like 30degrees. That is when I discovered a way to get down the mountain without having to stop for 5 mins ever single step. I walked backwards. My things were only used minimally and my calves did the bulk of the work. So, I literally walked backwards down the mountain. Yeah, I was the last one down but I made it and didn’t collapse/roll all the way down at least. After we got back we had a ‘lotus lantern’ making event. Essentially a paper cup with tissue paper glued to it. That didn’t go so well. I had more glue on my fingers than on the cup. The paper didn’t seem to want to stick to the cup so well so after 20 mins I gave up. Many others were making absolutely stunning looking ones but mine was looking rather sad. We also got a visit from KBS (A local TV station) who was filming for a TV show. We knew about this before hand so it was OK. When they came in, there was a famous Korean Actor that came with them. Never heard of him but I decided to get my picture taken with him any ways. It’s a little amusing to hear that when he was walking up to the temple, all the Koreans were pointing and exclaiming who he was. He walked into our room and no one batted an eye. He was a nice enough guy and some people got interviewed for the TV show episode. Hopefully I’ll be able to see that episode. I didn’t get in on the filming but I would be in the background somewhere :) His name is Hwang Bum Sik. After that we packed up and headed home. On the way back we stopped at a ‘hermitage’ place. I was told there wasn’t much walking. They lied. I only prayed that all the escalators were in service for the subways I had to take home. Home. 3 flights up steps up. I texted Bharati to meet me downstairs so she could grab my backpack off of me. All-in-all, it was a good trip, met some very nice people and would recommend it for anyone. In March I posted a mini-contest to see who could interpret some Korean characters and what the English word was. This is the word. Here is Shawn opening the parcel. My CHOPSTICKS ah… how nice, thank ah you very much! Enjoy da picture ah. The city bills itself as the ‘Colourful City’. Well, we weren’t disappointed. Although I find all the cities here very colourful. I will apply this ‘colourful’ term to the types of things I see here. As mentioned before, and pretty much common knowledge, Asians tend to copy till they figure out who they are instead of trying to be popular like the Western stuff that influences their young people. So when I see a posted for a Korean James-Bond type of movie, I immediately took a picture of it. Of course the ‘walking mascots’ are very popular for promoting some product or event too. Don’t ask me how Winnie The Poo is connected to anything in Korea though. There are many different shops in this area. Korea has done some great things in designing their downtown cores. They block off streets and cobblestone the whole place. It makes for wonderful shopping experiences and a cool place to hang too. So tell me, is this t-shirt from a good artist or a great artist? Remember when I wrote about Coffee in Korea? Well, if a massive 3-story coffee-house doesn’t prove that Korean’s love coffee, nothing will! A few blocks away and this same chain had another 2 story place as well! Click to see all the albums. 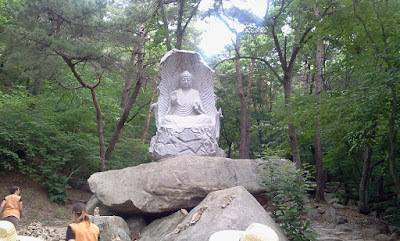 Our adventure continues with some video and pics from our excursion to Nami Island. The first, and obvious, is the cartoonish character. The whole culture over here seems child-like in advertising. Soft and/or bright colours and a lot of cartoonish characters. It’s kinda like re-living 50’s advertising in such a modern setting. The next thing you’ll notice are the two vertical black marks on the door. I couldn’t get a picture of the front of the train but it seems that either there are a lot of paint layers and they are cracking, and by layers I mean the type of layers you’d find when looking at a 50+ year-old house that has 20 layers of paint on it and peeling. The front of the train looked worse. 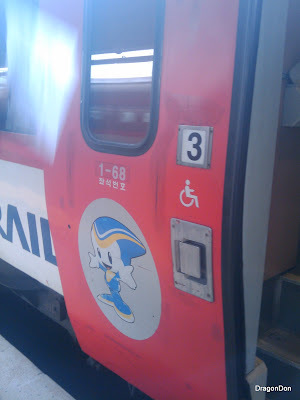 The train itself was very comfortable and quiet. So it’s not like the trains are falling apart, far from it. The seats even reclined and you had curtains and coat hooks with tons of leg room. So traveling anywhere of significant distance is pleasant. They even have a lady with a food cart that goes around selling snacks and drinks. Really smart people here. Taking a break from walking around Nami Island. More pictures around the island. See all 185 pics here. On the train ride home, saw a cool shot of a sunset. And finally, at the subway station grabbed this shot with the moon. Time for some more touristy things. 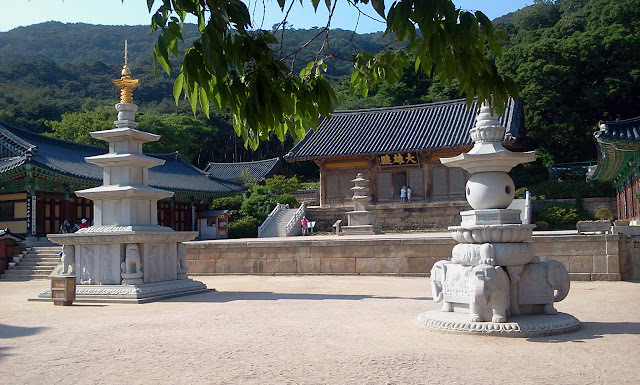 Korea is a very cold country and that means Palaces!